I am currently listening to a radio interview of Kobi Meidan with Shlomi Eldar on Galei Tzahal. 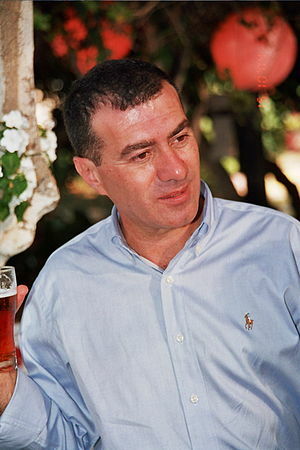 Kobi Meidan is one of the most prominent TV and radio interviewers in Israel, and Shlomi Eldar is one of the best and most appreciated among Israeli Hebrew-speaking journalists. Eldar has been covering the Palestinian Territories, particularly the Gaza Strip, for the Israeli Hebrew-speaking media during the past twenty years or so. Shlomi Eldar is the perfect journalist – he is very courageous and extremely sensitive both to people as individuals and to public trends. He relies not on official statements or briefings but on information he collects meticulously with his bare hands and from ordinary Palestinians who act as his contact persons. He avoids falling into the trap of taking sides and preaching. He says he tries to capture the complex picture of this delicate Israeli-Palestinian situation, and in his case you can believe it because his reports leave you with clear deep thoughts rather than futile rage or stupid schadenfreude. The main topic of the interview with Kobi Meidan, to which I currently listen, is Eldar’s new documentary film about a Palestinian baby with serious genetic immunodeficiency who has been treated in Israel after his two brothers lost their lives to the disease shortly after their birth. Eldar says he became emotionally involved with the subjects of his films, to a degree that he made his best efforts to facilitate the treatment. He says he nearly abandoned the project when the baby’s mother said before cameras that she would happily send her child to be a suicide-bomber. Then he realized that he should understand the deep streams that cause this paradox of a woman trying to save her baby and at the same time wishes him to become a suicide-bomber rather than get angry and abandon the scene. Kobi Meidan suggested that the mother tried to be “more Catholic than the pope”, namely that she has to make extremist statements in order not to be suspected with collaboration. Two very important points I heard in this interview relate to the kidnapping of Gilad Schalit in June 2006 and to “Operation Cast Lead” in December 2008. Eldar says he managed to reach the kidnappers of Gilad Schalit through one of his contact persons in Gaza. The contact person did not want to be the courier. “You Israelis are mad”, he said, implying that the Israel Defense Forces might relate him to the kidnapping and kill him. Eldar eventually convinced him. He came back with the following information: The kidnappers are confused and frightened. They want to end this affair as quickly as possible and ask for a low “price” (much lower than the current demands of the Hamas kidnappers, according to Eldar). Eldar further says that when he delivered this message to Israeli military officials they told him to mind his own business. This story reminded me of another report, according to which Israeli military investigators knew almost for sure that Ehud Goldwasser and Eldad Regev had been killed during Hizbollah’s invasion into northern Israel in July 2006, i.e. Hizbollah kidnapped dead bodies rather than living soldiers, but this crucial information did not reach the higher-rank officials. Apparently Israel has good intelligence, good professionals and it succeeded in having strong deterrence against its adversaries. This begs the question: why doesn’t Israel make wise use of these assets? Why does it let itself fall into traps set by organizations like Hamas and Hizbollah when it has all the information and measures needed to avoid them? Why does it let an Israeli soldiers remain at the hands of his kidnappers when it can end the affair within a short while? Why isn’t it more prudent about using force when it has the capability to carefully assess the benefit against the damage? In short – the brain is there, the means are there, so how come the decision making is so poor? Shlomi Eldar went on telling about consequences of the bloodcurdling phone call he received while on air from Dr. Abu al-Aish, a Palestinian Gazan physician who used to work at Tel HaShomer medical center in Israel. Dr. Abu al-Aish told Shlomi Eldar with heart rending cries about the killing of his daughters from an Israeli shell, while Israeli television viewers hear it all live through their TV sets. Eldar says the then-Israeli Prime Minister shed some tears when hearing the broadcast. A ceasefire was declared the next day. Israel had every right to attack Gaza, Eldar says, pointing out to the Qassam rocket attacks on Sderot and southern Israel. But at the same time he said Israel used too much force. He says he was condemned for his view during the first days of Operation “Cast Lead”, but not after the phone call from Dr. Abu al-Aish. People like Shlomi Eldar can and should be more common in our society.